Take a peek at our bandicoot pictures. It's a little difficult to get a really great photograph of a bandicoot, but here's a few to give you an idea of what these little marsupials look like. We were able to get several videos of our resident bandicoots. 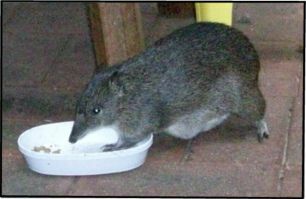 This short video shows a bandicoot on the back patio. Is that Pounce, or Bounce, running around looking for a treat? And here , Bounce and Pounce are playing chase! If you click on the Cootspal link at the top right corner of any of the bandicoot videos you'll be able to watch them all. One of our female bandicoots with what seems to be a healed nose injury. You can see a difference in the quality of the fur on her nose. She may have poked her nose into a tin can or other confined space and had difficulty getting free. She is full of very lively babies; we can see lots of movement as they tumble around inside her pouch. Soon she will have to leave them in the nest when she goes out, as they will be too large and active to be carried around. 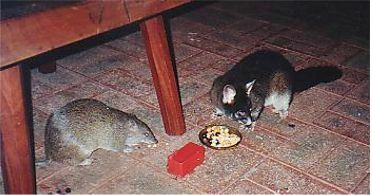 A young female bandicoot finds a dish of salmon meant for Topaz the cat. The mouth is blurry due to the extreme speed with which bandicoots use their tongues. You can see the detail of the bandicoot's feet and toes particularly well in this photo. The nails are efficient digging tools. 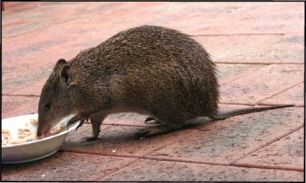 People who have bandicoots in their yard will never be bothered by lawn beetles and grubs. Here’s Trundle the echidna, who lives in Karen’s new yard in Tasmania, and who is always busy looking for ants and worms and other tasty snacks. He can run surprisingly fast over short distances, but his main defence is the ability to dig straight down and vanish in half a minute, using his strong claws as excavation tools. In the meadow behind the house lives a family of native hens, which aren’t hens at all but are related to the rail family. They can’t fly, but can run very fast, like the bird in the Roadrunner cartoon. They make a muted booming sound when alarmed, like a muffled drum, and flick their stubby tails.